It's not a big secret that I love lots of layers on my cards...and of course, sparkle. It was fun to create a holiday card when it was 105 degrees in South Texas in July, too. Two of my favorite things...the Button Buddies stamp set and Corduroy Buttons (retired). A friend who received one of these cards told me she framed it to put out every year in her home for Thanksgiving. That totally made my day! 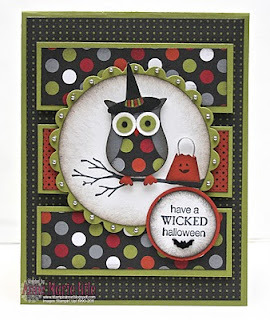 This little owl card was so much fun to make! Actually, I liked this card so much, I never sent it out. The treat bag with the bitty face just makes me smile. :) This card also made it into the "took-over-3-hours-to-make-club" because I kept adding more and more to it. This fold always intimidated me, but was really pretty easy to make. I also seemed to be sponging ink on EVERY edge of my cards for a few months this year. Isn't it funny how you get into using a technique and it becomes your "thing" for a while? I really wanted to try to make a Christmas card with very non-traditional colors and I loved how this one came out. This Mocha Morning DSP is GORGEOUS!! The sketch (designed by Lesley from the Paper Players) is one of my favorites, also. 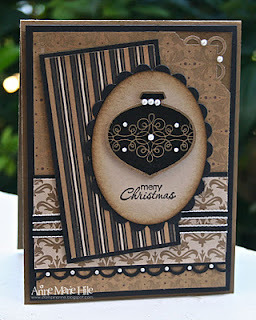 The Snow Swirled stamp set has seen a LOT of ink in my stamp studio. There is something about the way that tree looks embossed. 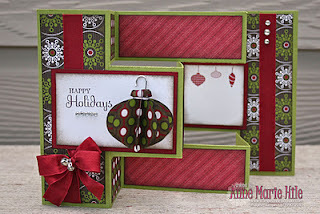 This was for Ann's CAS color challenge over at the Paper Players. I really learned to like CAS cards over the past year...although I still tend to use a lot of layers on them. What a fantastic year in review, Anne Marie! 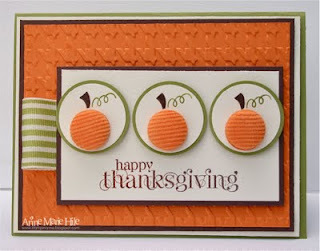 Love them all but I agree with your friend who received the Corduroy Pumpkins card - it is just stunning! And I would have totally framed it as well. Can't wait to see what you create for 2012! Wow AM, your cards are always SO gorgeous. I love the rich colours on them and the embossing. My favourite is December's amazing card! It is lovely. Those Corduroy Pumpkins are super sweet too! I have to agree. I love the pumpkins. I very recently discovered your blog and have gone back to view some of your past work. I really really like your style and see lots of opportunities to case your cards (with proper credit of course). I look forward to even more inspiration in 2012!! More fantastic creations! I really liked your wicked owl too! LOL on finishing Christmas cards on time! I think I was lulled into security with the stack I had, but when it came time to mail, I was frantically finishing just a few more! 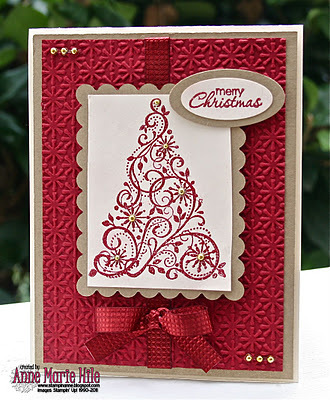 Wonderful cards and so much fun to look back at what you have made. Hope y'all had a great holiday. What a great selection! Love that one with the brad pumpkins. Wishing you a crafty, happy new year, Anne Marie! Love them all! 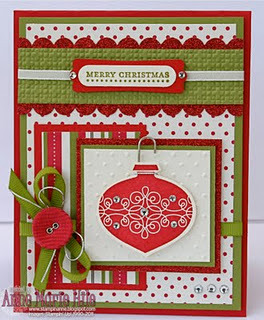 The ornament punch is great, so no wonder you reach for it a lot!! Love the year in review, I was thinking of doing that myself.I think that most of my picks would be Halloween cards!! You know that my favorite Card is the Halloween Owl Card... I love love love that one! !